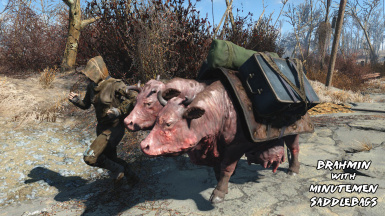 Beast Master provides a stream-lined, immersive way to tame and command the creatures of the Wasteland. Your captured creatures will become more than just mindless pets; they will be true companions. 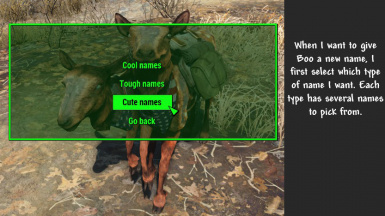 Give them unique names, equip them with saddlebags and accessories, and even have them scavenge for items! Main: Fixed a bug when trying to collect an item found by your 2nd creature. 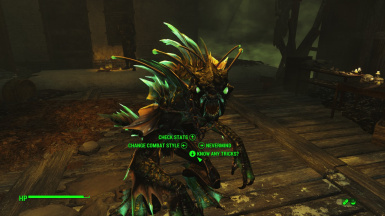 Exotic Creatures Patch: You can now tame Nuka World creatures! Yay! YOU MUST HAVE NUKA WORLD DLC TO USE THIS VERSION OF THE PATCH. Life is busy and the Training update is taking a long time to complete, so this is an intermediary update with some of the new features from the Training update, minus the training itself. Hurting your creatures will no longer decrease happiness. Using Mutating Serums on them will still decrease happiness, however. 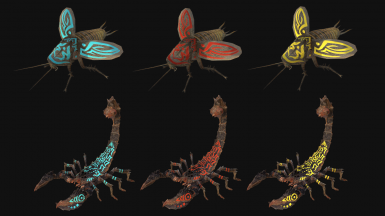 Glowing creatures that you tame will no longer cause your settlers to aggro if they come too close. Added a helper function that will automatically prevent creatures from losing their paint jobs after fast travel. Patch: Fixed the ghoul spawning problem. I somehow forgot to include the texture files need for fogcrawler and bloodrage mirelurk paint. Sorry about that. Tis fixed. -Can now catch all types of feral ghouls, not just those closest to your level. 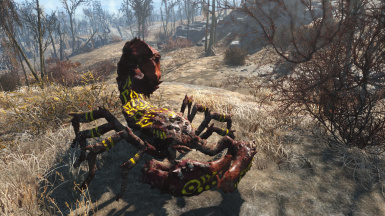 -Fixed a bug that prevented mirelurk razorclaws from being painted. -Fixed a bug that prevented the lowest tier of stingwings from being painted. 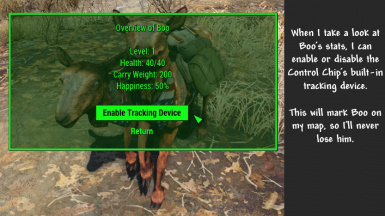 -Fixed a bug where the carryweight or happiness bonus from saddlebags, bandanas, collars, and paints would be removed upon reloading the game. -Fixed a bug that was preventing your creature's Happiness from actually boosting their stats. Whoops. -Added a fix that will prevent tamed creatures from causing a CTD when targeted in VATs. -Your creature will no longer gain happiness or find items while "Waiting". -You will now be notified when your creature finds an item. -Added green Tribal paint. :D Requires green paint, naturally. -Added a new Beast Master Holotape. The new holotape not only has instructions covering every part of the mod (for easy in-game reference), it also allows you to toggle various settings and debug your creatures. Patch: Bloodrage mirelurks can now be painted. Patch: Fog Crawlers can now be painted. Patch: Fixed the saddlebag, bandana, and chain collar meshes for wolves. -Added the ability to tame creatures using just your voice, if you have the necessary charisma perks. I also re-worked how the regular and advanced control chips functions, to try to make things a little easier to understand. 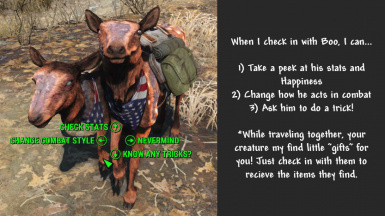 -If you have the Animal Friend perk, you can tame cage-caught animals by speaking to them. 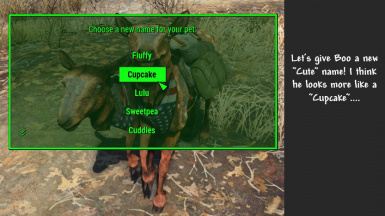 -If you have the Wasteland Whisperer perk, you can tame cage-caught creatures by speaking to them. -If you have the Science 1 perk, you can craft a Control Chip, which can be used to tame cage-caught animals. -If you have the Science 3 perk, you can craft an Advanced Control Chip, which can be used to tame cage-caught creatures. -All cage-caught creatures will now level with the player. -Creatures will now enter "sneak-mode" when you begin sneaking. -All creatures will now follow you through interior/exterior load doors. -Changed the "Wacky" name Jaggles to Jangles. It was supposed to be Jangles (ala Jangles the Moon Monkey) originally, but I misspelled it. -Control chips will now play a sound when used to tame something. -Removed radiation cloak effect from glowing creatures. This will prevent most instances of random NPCs attacking your glowing pets. -Implemented a fix that will hopefully stop NPCs from randomly attacking your creature companions based on their faction. (Dismiss and re-hire to make it take effect). -The Inspirational perk will now work on your creature companions. (Dismiss and re-hire to make it take effect). Patch: Wolf cages will now catch all types of wolves, not just those closest to your level. -Added a body paint skin to fit the "thin" version of stingwings. Previously, thin stingwings would use the normal-sized skin, causing floating paint. Set all cage creatures to be non-respawning, which will stop them from changing types on fast travel. 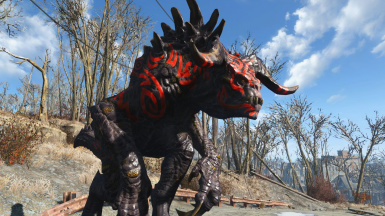 Ever find yourself wishing that you could have a Deathclaw or Radstag as your loyal companion? Disappointed by the creature "taming" mechanic introduced by Wasteland Workshop? Beast Master is exactly what you've been hoping for. Beast Master provides a stream-lined, immersive method for taming, commanding, and interacting with the creatures of the Wasteland. But more than that, Beast Master introduces a brand-new creature companion framework, built from the ground up to give you the type of satisfying companionship you thought you could only get from a vanilla companion. 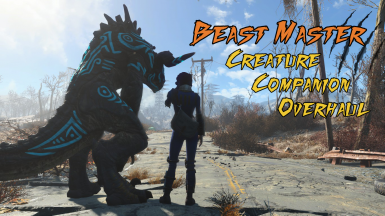 Beast Master allows you to tame the creatures caught through Wasteland Workshop through use of a new item called the Control Chip. Creatures implanted with a Control Chip will gain enhanced intelligence and be able to understand human speech, allowing you to talk to them, give them commands, even recruit them as a companion. Both the Control Chip and the Advanced Control Chip can be crafted at the chemistry workbench under "Utility". Simply approach the creature you wish to tame with a Control Chip in hand and choose the option "Inject Control Chip" to get things started. Animal Friend > Tame captured animals by speaking to them. Wasteland Whisperer > Tame captured creatures by speaking to them. *Animals include: Dogs, brahmin, radstags, etc. *Creatures include: Deathclaws, mirelurks, radscorpions, etc. I want to tame ALL the creatures! Can I have more than 1 creature companion at a time? Take them with you on your adventures! 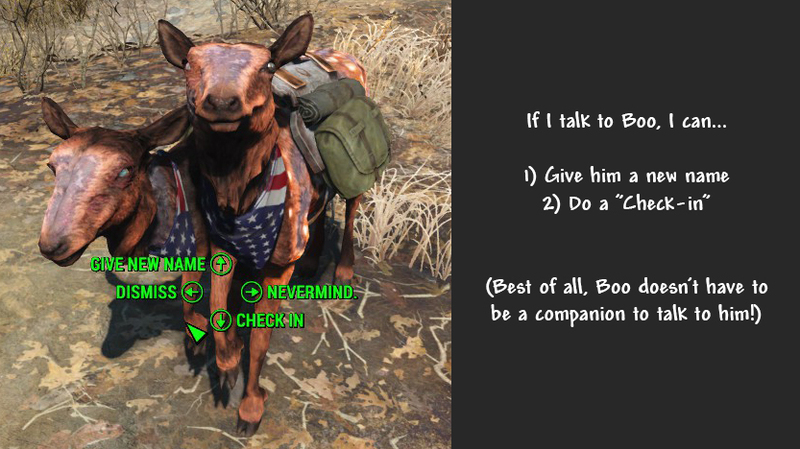 Beast Master uses a brand-new companion system that won't conflict with any other companion mods. Best of all, this means that you can have a human companion (or Dogmeat) AND a creature companion! Give them a new name! There are 4 name categories each with 10 different names, for a whopping total of 40 unique names to choose from. Get them to love you by increasing their Happiness! Like the Affinity system for human companions, your creature companions will react to how you treat them. Keep them happy by treating them well, and reap the benefits. Cook up special animal treats at any cooking pot for your pets. Animal treats confer small benefits to your creatures, and make them happy. Certain types of creatures can use saddlebags to increase their carrying capacity. Saddlebags can even by dyed to match your favorite faction. Dress them up with accessories! Certain types of creatures can be equipped with bandanas or collars. Your pets will be happier when dressed to the nines. Paint them with body paint! 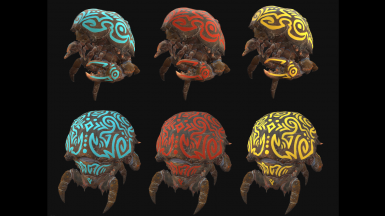 Creatures with scales or shells can be given a makeover with different painted designs. Like accessories, body paint also increases Happiness. Check in with your pet to see their level, health, carry weight, and happiness. Get them to scavenge for items! Mark them on your map! Enable or disable the Control Chip's built-in tracking device so that you'll always know where to find your creature companion. Pets can be asked to perform a special trick, although they may ignore you if they are unhappy with you. 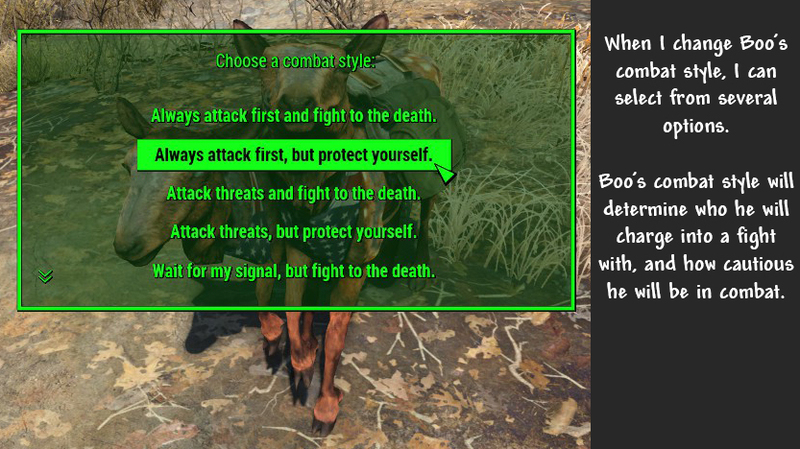 Set how your pet will react in combat - how eager they are to attack, and how cautious they will be during a fight. Inject them with Mutating Serums! So...that's a lot of stuff. Confused about how to do all that? Worried that it will be complex or hard? Worry not! It's actually very easy. Click on the spoiler to see a visual walk-through of some of the dialogue options! Your new pets will come to love you (or hate you) based on how you treat them. All newly-tamed pets will be tolerant of you, but no more. But as you spend them with them, feed them treats, and spruce up their appearance, their Happiness will increase. The happier your pet is, the stronger and faster it will be in combat. Pets that love you dearly will even sometimes bring you "gifts" that they find as the two of you wander the Wasteland. But beware! Those who mistreat their pets will find that they become less effective in combat. Pets that despise you even have a chance to turn on you and attack! Once a creature has been tamed with a Control Chip, you can give it a brand new name by talking to it and choosing "Give new name." If you aren't happy with your decision, you can change your pet's name at any time. 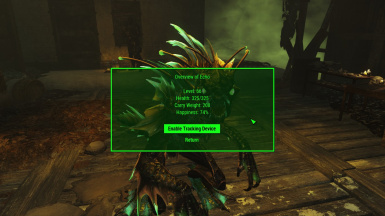 Need a way to distinguish YOUR deathclaw from that other deathclaw that wants to evicerate you? 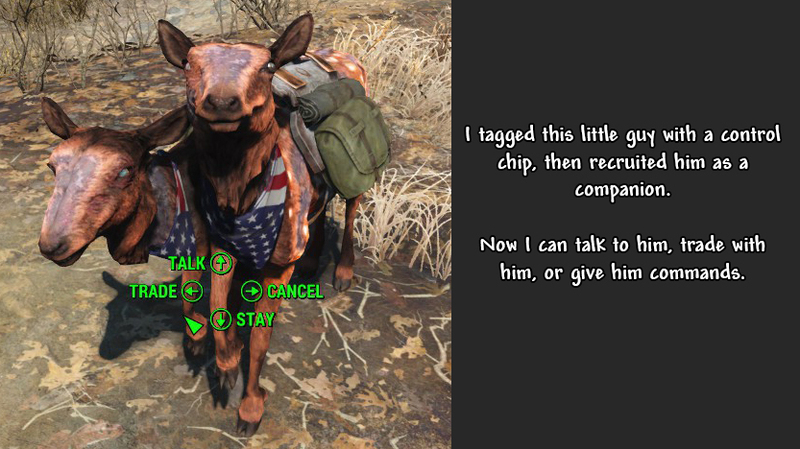 Or just want to play dress-up with your new wasteland pet? If so, Beast Master adds several different ways for you to give your pet some serious bling. 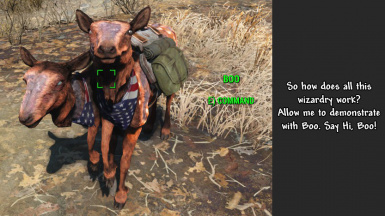 Various articles of clothing that you find around the Commonwealth can now be used by more than just Dogmeat. Many of the most common creature types can be equipped with them. Like body paint, these items will provide a boost to your pet's Happiness. Currently, your pets can be equipped with the following items. More are likely to be added in future updates. Need an extra hand lugging around all that junk? 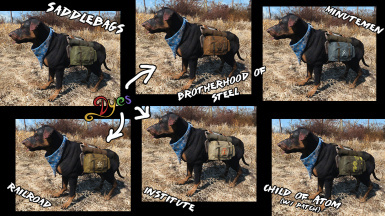 Equip your pet with a saddlebag to increase their carrying capacity! Saddlebags can be crafted at the chemistry station under "Utility". Once crafted, saddlebags can be dyed at the armor workbench to match the color of your favorite faction: Brotherhood of Steel, Institute, Railroad, or Minutemen. (A Children Of Atom dye-job is available with the Exotic Creatures patch). Red, yellow, green, or blue paint can be used on pets with shells or scales to give them a brand new look and increase their happiness. If you get tired of your pet's body paint, you can scrub it off with Turpentine. To paint your pet, you first need to find Yellow Paint, Blue Paint, Green Paint, or a Blood Can. Then, talk to them and choose "Check In". Now in the check-in menu, you will see the option "Apply Paint". "Remove Paint" will appear instead if the creature is already painted and you have some turpentine in your inventory. NEW! 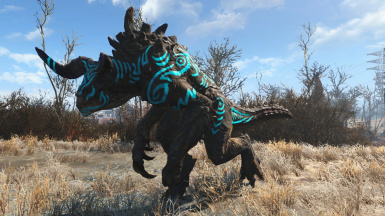 If you have the Exotic Creatures patch, you can paint your pet with a new Child of Atom design! Requires Glowing Paint, which can be crafted at the chemistry station if you are allied with the Children of Atom. Animal treats can be created at the cooking pot and given to your pets by talking with them, choosing "Check in", and then selecting "Feed Treat". Each treat will give your pet a small temporary boost and slightly increase their happiness. You can't just stuff your pet with treats to make them love you, however - your pet will get full after 3 treats, and you will need to wait a while before they get hungry again. Crispy Bits Treat > +30% HP regen for 5 min. Slightly increases happiness. Meat Cake Treat > +25 HP for 5 min. Slightly increases happiness. Spazz Out Treat > +15% speed for 5 min. Slightly increases happiness. Harness the power of radiation by crafting Mutating Serum syringer ammo at the chemistry station. Creatures shot with a Mutating Serum round will become juggernauts in combat for a short time, but at the cost of decreasing their happiness. Mutating Serum: Super Strength > The target deals 2x damage for 5 minutes. Decreases happiness. Mutating Serum: Venom Claws > The target's attacks do poison damage for 5 minutes. Decreases happiness. Mutating Serum: Atom's Glow > The target becomes highly radioactive for 5 minutes. Decreases happiness. 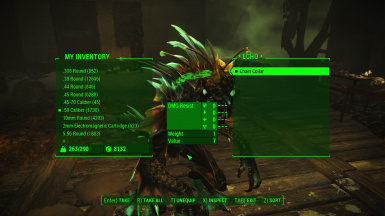 Having trouble getting close enough to that raging Deathclaw to use an Advanced Control Chip? Pacify it with a Tranquilizer round from your Syringer! Tranquilizer rounds can be crafted at the chemistry station with other types of Syringer ammo, and will calm any bug or animal for 60 seconds. In any settlement where you have tamed creatures, open and close the workshop. This will reset the background scripts. Q: When I try to talk to one of my pets, it doesn't respond! Help! A:1) Look away from the creature, then look back and talk to them again. Sometimes the dialogue won't trigger the first time. 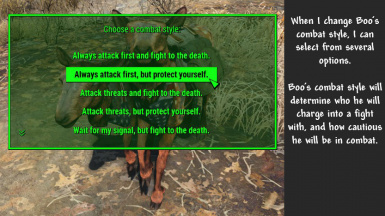 2) Some creatures, Deathclaws particularly, are finicky about where your cursor needs to be to make the dialogue wheel appear. There is nothing I can do about this - just get up in their face and keep trying. Q: I don't have the option to use a control chip...the prompt never appears. A: First: Did you catch the creature in a cage? Only cage-caught creatures (and junkyard dogs and brahmin) can be tamed. Second: Are you using the right type of control chip? Regular control chips will only work on animals; advanced control chips will only work on creatures. Third: Did you catch the creature before installing Beast Master version 1.1 or later? If so, you will need to catch a new creature. Fourth: Check your load order. 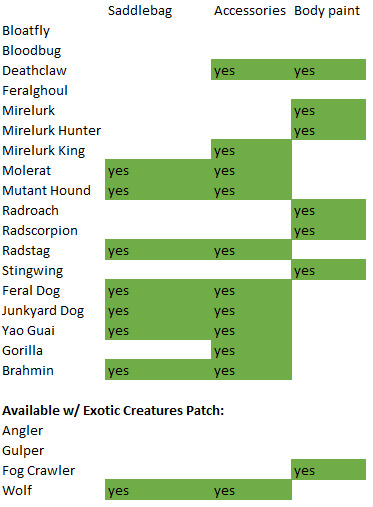 NOTHING should be overriding Beast Master, except the Exotic Creatures patch. A: First, check to make sure that your creature CAN be painted. Refer to the handy-dandy Creature Bling chart I so helpfully made for you. Next, you need to have "Yellow Paint", "Blue Paint", or "Blood Can" in your inventory. If you still don't see the option to "Apply Paint" after selecting "Check in", then you need to do 2 things: Update to the latest version of Beast Master, and check your load order. And finally, if you are using Beast Master v1.1 or newer, you will need to catch NEW creatures! The old creatures will not be able to painted. SERIOUSLY PEOPLE. MAKE SURE NOTHING IS OVERRIDING BEAST MASTER EXCEPT THE PATCH. CHECK YOUR LOAD ORDER. A: Yes. 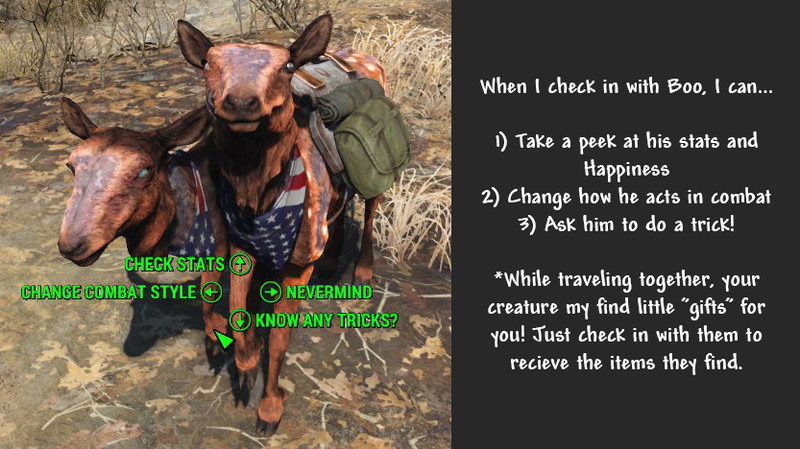 While a creature is traveling with you as your companion, it's set as 'essential', so it can't be killed. At any other time, tamed creatures are set as 'protected', which means that only YOU can kill them. Q: Will my creatures level with me? A: Yes! New in version 1.2, your faithful creature companions will now level with you. NOTE: If your creature was caught before version 1.1, you will need to catch a new creature. Old creatures just don't have all the benefits introduced in the newer versions. No, there's no way to 'fix' that. 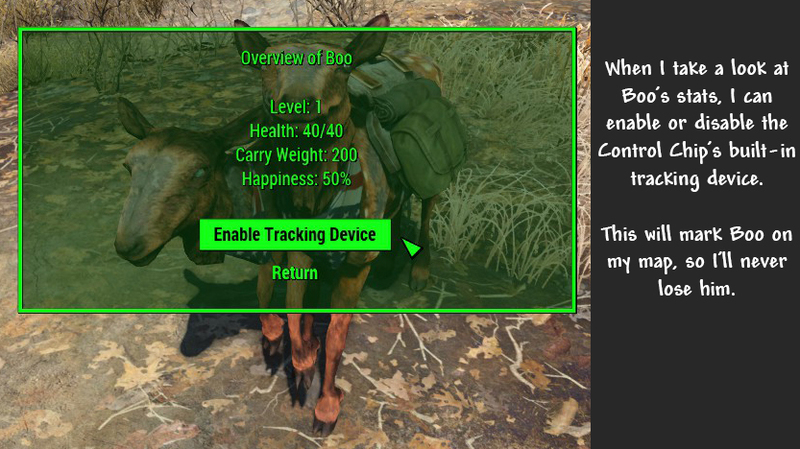 Q: Does the "Inspirational" perk work on my creature companions? A: Yes! With version 1.2, your creatures will now get the full benefits of the "Inspirational" perk. NOTE: If you caught your creature in an earlier version, you need to dismiss and re-recruit them! Q: Is this compatible with x companion mod? 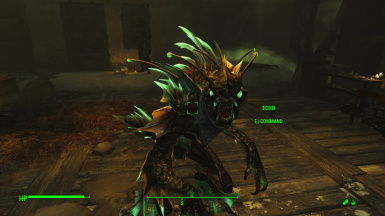 Q: Can I use Beast Master to tame the creatures from Far Harbor? I really want a wolf companion. A: I'm glad you asked that question! 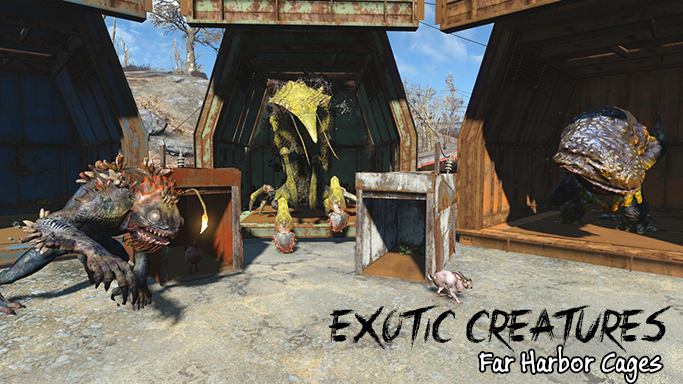 It just so happens that I created a complimentary mod, Exotic Creatures - Far Harbor Cages that allows you to craft cages to capture Far Harbor creatures. There is also a patch available to bridge the gap, allowing you to have the wolf buddy you always wanted. Get both the mod and the patch under "Files". Q: Will you port this to console?